When I was in San Diego last month for the annual meeting of the SBL, I picked up a handful of really interesting books. The first one I decided to read was Justin Marc Smith’s monograph, Why Bios? 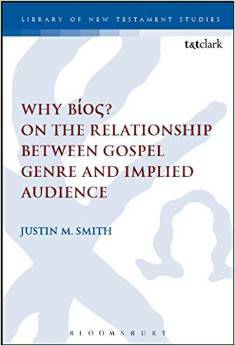 On the Relationship Between Gospel Genre and Implied Audience (LNTS 518; London: Bloomsbury / T & T Clark, 2015). This volume is a revised version of Smith’s dissertation from St. Andrews. The book was of immediate interest to me for several reasons. First, in my SBL paper, one of my major points was that we need to take seriously the gospels as Greco-Rmoan biographies in order to make arguments about narrative techniques and characterization. I was therefore very interested to see what Smith had to say. Second, in a future project I intend to develop a via media between the Brown/Martyn hypothesis about the Johannine community and the Bauckham/Klink “gospels-for-all-Christians” model. At the heart of that debate are deliberations about the nature and scope of the gospels. Smith’s treatment is insightful and conversant with a great deal of material both within and outside of the discipline of gospels research. I am sure this work will become a dialogue partner for me in my future research on this topic. I have already identified some areas in which Smith and I disagree, but I’ll save those for a future time. For now, I recommend this resource to those interested in this important discussion. This monograph definitely contributes to advancing the current state of the discussion. Thanks for the note here. I’m sure there are a few spots where we don’t see completely eye-to-eye, but I do think there are some interesting points of intersection as it relates to character development in the Gospels and in Greco-Roman Biography. I’d like to think that this could be a middle path through the two extremes that you mention. I look forward to being a dialogue partner with you in this. Man, that was a pretty fast reply, Justin! Yes. Nice work in the book. The book I’m thinking of writing is about 2 years away (have to wait for a sabbatical) but I want to make sure we stay in touch on this topic. He may have edited content for LNTS, but for those of us whose institutional libraries do not invest in monographs often this is another way to access his research! It’s a slow day here in Southern California. Keep me in the loop. Justin – Stephen Barton was my primary supervisor, by the way. He is wonderful, hope he was helpful. He really was. We should chat next year at SBL. I had some interesting experiences going through my viva. He was a steadying influence in that process. I am very grateful to/for him. Reblogged this on Texts, Rhymes and Strife.